The existing subway map appears to be different for normal viewers and those with colour blindness. 97 per cent of the people can easily understand the colour-coded subway map, but the remaining 3 per cent, colour-blind people, struggle at transfer stations where multiple lines intersect. Focusing on the obstacles experienced by colour-blind people firstly, curves were used for this subway map instead of straight lines. Secondly, increasing the contrast made the lines more easily noticeable. Thirdly, numbers were added to give transfer information; and fourthly, symbols that represent surrounding landmarks provide additional orientation. Lastly, the map reflects the geography of each station’s actual location in a more realistic way. 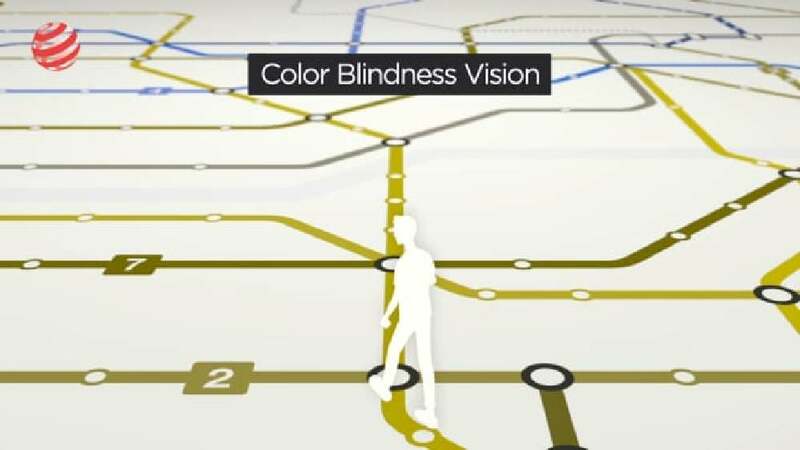 As a result, colour-blind people find their route twice as fast as before, and even normal viewers spend less time than they used to searching for a route. Thus, in the end, this example of social responsibility not only solved many people’s problems, it was also acclaimed by the media, alongside enhancing the brand’s image. The question of how colour-blind people can be helped to more easily read subway maps is solved by this work in an intelligent manner: curves, numbers and symbols were added to the different subway lines to now provide additional information alongside the otherwise familiar colour coding, thus creating more differentiation and making the map easier and faster to read. The fact that this also helps people with normal eyesight is an outstanding additional benefit.